Macy Ashby, Ret. Colonel Don Patton and Steve Chicoine presented author Mark T. Calhoun to South High students and staff, March 24, in the South High Media Center. Calhoun - in town as part of the WWII Roundtable at Ft. Snelling, - shared the wealth of his research about the life of Minnesota-born, South High alum, and WW II Lt. General Lesly McNair. Mr. Calhoun knows it well, coming from the United States Army School of Advanced Military Studies. From his presentation at South High: Author Mark T. Calhoun shared his journey as a historian, researching a man he greatly admired. The work, sifting through any information he could find, proved difficult as McNair's wife, in her grief, destroyed her husband's papers after his death. Some days could be long and laborious, Calhoun said, "some days are dry and you find nothing. Other days, you find a treasure." One of those treasure-finding days, Calhoun says, happened when he pulled a map from a book, unfolded it and discovered it was the very map McNair used out in the field. Its authenticity made all the more real in finding it covered with splatters of McNair's blood. Calhoun quizzed students, asking if they knew where Verndale, Minnesota was. This was where McNair was born. No one knew where Verndale is located, but when Calhoun said it was close to Brainerd, all had a reference point for how far his parents decided to travel to get their son a sound education that would make great things for him possible. That destination was Minneapolis and the education for him was at South High where he graduated in 1897. McNair applied to Annapolis, wanted to be a Navy man. But grew frustrated with the wait hearing whether or not he was accepted, so he applied to West Point. Calhoun said, McNair couldn't have gotten in to either--as it happened he got in to both- IF he hadn't gone to South. He told the students listening, "Think of it. Where you go to school affords you all kinds of opportunities." He went on to describe McNair's driven work ethic. "He liked hard work and being around troops doing hard work. McNair went to the front twice during the war." Troops were invigorated seeing a man of his stature in the trenches with them. Unfortunately, doing exactly that, is what put McNair in harms way. He along with many other infantryman were hit by German artillery and that is how his life ended. From "The Round Tablette" of the World War II History Round Table at Fort Snelling. Born in Verndale, Minnesota, McNair lived there until he turned 14. The family moved to Minneapolis so the children could go to high school, McNair graduated from South High in 1897. While waiting to start at the US Naval Academy, McNair attended and graduated the Minnesota School of Business in Minneapolis, studying mechanical engineering, woodworking, bookkeeping, and statistics. He grew frustrated with waiting for the Naval Academy and instead applied to the US Military Academy at West Point and was accepted immediately and graduated- in 1904. McNair began his career in the artillery branch of the Army but his earlier studies in mechanical engineering and statistics also made him valuable- able in the Ordnance Department. Throughout his career McNair alternated between various staff positions in artillery, logistics, and ordnance. During the World War I, McNair was part of the 1st Division and was in charge of pre- deployment training. When the 1st Division deployed to France McNair was on the American Expeditionary Forces command staff in charge of artillery training and tactics. He impressed his superiors so much that at age 35 he became a brigadier general, the youngest at the time. En route to France on a transport ship, he bunked with and a formed a lifelong friendship with George C. Marshall. After the war, McNair was reduced to the peace-time rank of major and like many in the military at the time went from post to post. He continued his military education at Fort Leavenworth- and then later at the Army War Col- College (1928-29), was posted in Hawaii (1921-24) and reviewed the Army’s War Plan Orange, and worked on coastal artillery plans, and served as a ROTC professor at Purdue University (1924-28). In 1934-35, he commanded District E of the Civilian Conservation Corps at Camp Beauregard, LA and gained practical experience at inducting, housing, feeding, organizing, training, and directing thousands of men. In 1935, he became executive- officer for the Army’s Chief of Field Artillery- and was promoted brigadier general in January of 1937. He served as commander of the 2nd FA Brigade 1937-1939, and then became commandant of the Command and General Staff College before becoming a major general and chief of staff of the General Head- quarters, US Army, 1940-1942. After America entered World War II, McNair, in March 1942, became a Lieutenant General and commanded the Army Ground forces; he was in charge of organization, train- training, and preparation of combat troops for over- seas service. However, because of the urgent need for troops overseas much of the basic training had to be abbreviated and McNair was roundly criticized for this, even though an infantryman is never fully trained until they engage the enemy. During Operation COBRA, on July 25th, 1944, McNair was at the front, near St. Lô, France, to observe the troops in action to better determine training needs. Aerial support had been called in to break through the German lines, and an American bomb landed on Mc- Nair, who was in a front line trench. Twelve days, later, McNair’s only son, Colonel Doug McNair was killed by a sniper on Guam. It was then that legend had it that his wife burned all his papers, but she did not. McNair’s papers were sent to the National Archives, and much like McNair himself passed into history. McNair was one of four lieutenant generals to be killed in the war. He and LTG Simon Buckner were posthumously promoted general (4 stars) in 1954. Having spent most of his career as staff officer, McNair did not shine in the spotlight of history like a George Patton, or Omar Bradley, but without his organizational and training skills the Army would not have been as effective for those in the headlines. 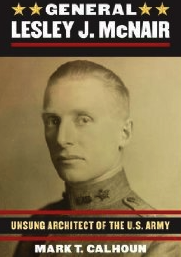 Mark T. Calhoun, General Lesley J. McNair: Unsung Architect of the US Army (Lawrence, KS: University Press of Kansas, 2015). Peter R. Mansoor, The GI Offensive in Europe: The Triumph of American Infantry Divisions, 1941-1945 (Lawrence, KS: University Press of Kansas, 1999). Williamson Murray and Allan R. Millett, A War to be Won: Fighting the Second World War (Cambridge, MA: Belknap, Press, 2000). Edward G. Miller, Nothing Less Than Full Victory : Americans at War in Europe, 1944-1945 (Annapolis, MD: Naval Institute Press, 2007). Peter J. Schifferle, America’s School for War: Fort Leavenworth, Officer Education, and Victory- World War II (Lawrence, KS: University Press of Kansas, 2010).